The team, led by University at Buffalo scientists, found that by focusing on gene changes caused by influences other than DNA sequences — called epigenetics — it was possible to reverse memory decline in an animal model of AD. 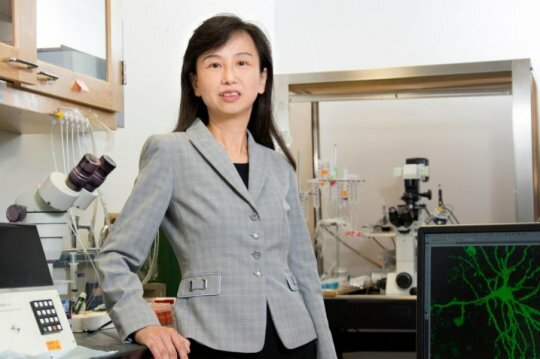 “In this paper, we have not only identified the epigenetic factors that contribute to the memory loss, we also found ways to temporarily reverse them in an animal model of AD,” said senior author Zhen Yan, PhD, a SUNY Distinguished Professor in the Department of Physiology and Biophysics in the Jacobs School of Medicine and Biomedical Sciences at UB. “We found that in Alzheimer’s disease, many subunits of glutamate receptors in the frontal cortex are downregulated, disrupting the excitatory signals, which impairs working memory,” Yan said. “This AD-linked abnormal histone modification is what represses gene expression, diminishing glutamate receptors, which leads to loss of synaptic function and memory deficits,” Yan said. “Our study not only reveals the correlation between epigenetic changes and AD, we also found we can correct the cognitive dysfunction by targeting the epigenetic enzymes to restore glutamate receptors,” Yan said. “When we gave the AD animals this enzyme inhibitor, we saw the rescue of cognitive function confirmed through evaluations of recognition memory, spatial memory and working memory. We were quite surprised to see such dramatic cognitive improvement,” Yan said. “An epigenetic approach can correct a network of genes, which will collectively restore cells to their normal state and restore the complex brain function,” she explained. Health trick: How each of us can be about 90 years old! Health trick: How each of us can be 90 years old!